...........a little different with your hair?? This style caught my eye whilst flicking through the Sunday supplement magazine in the UK (one of the models in a fashion shoot had her hair like this). I loved the look and I decided I had to give it a try. Last week I finally got the chance to try it out on a friend, and here are the results. This is such a simple look, and I think it will be fabulous in the Summer for keeping your hair out of the way whilst looking stylish. Step 1 - Clip your hair up out of the way. Step 2 - Place your ribbon around your hairline and tie in the nape of your neck. Now let your hair down out of the clip. 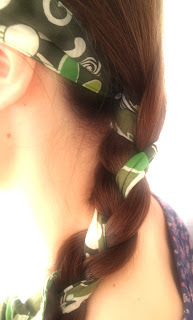 Step 3 - Part your hair into 2 pieces and using the ribbon as the 3rd piece start to braid them together. Step 4 - Once you have braided the length of your hair, use the hair elastic to secure in place. Step 5 - Now wrap the left over ribbon around the elastic and tie in a bow.